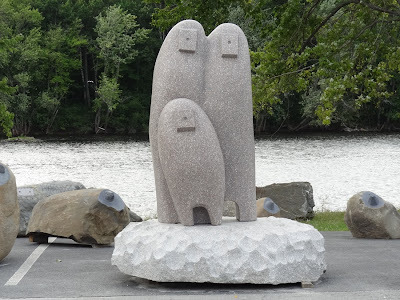 This granite sculpture will be moved to the Bangor Waterfront from its current location at the University of Maine where it was created by sculptor Koichi Ogino of Japan. The City of Bangor commissioned the artist at the 2012 Schoodic International Sculpture Symposium (SISS) to create the waterfront piece. Do you like it? Check out the other 2012 SISS sculptures commissioned by the City of Orono, Acadia Hospital, Husson University, and the University of Maine. To see Queen City Quiz #3, click here.